After setting up working Tor hidden service, the next step to ultimate security is having properly implemented Public Key Infrastructure (PKI). For this step, there are a lot of tutorials already existing and there is not much that needs to be added to them. Personally, I was using tutorial available here for the second time now and I find it very well-written. Because I am going to follow this tutorial, I will just post commands that have to be executed. Before starting, I have to add one important remark. 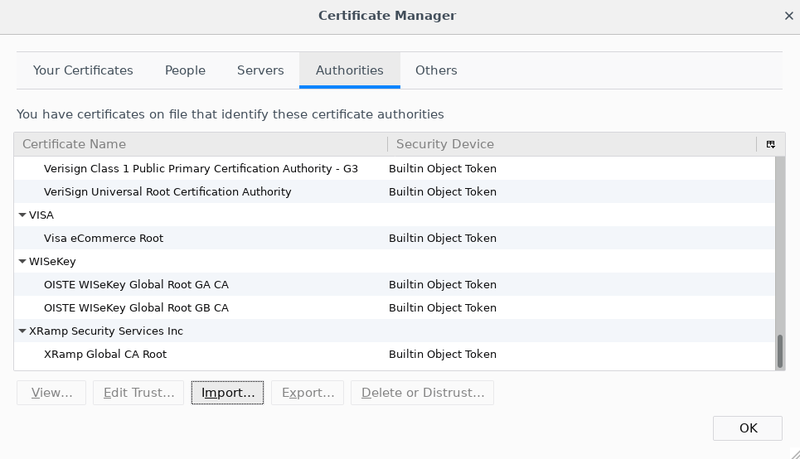 To make our PKI really secure one, it is crucial to have root CA air-gapped, that is device, on which it will be generated should be disconnected permanently from the internet. Good candidate for such a device might be some old laptop or Raspberry Pi Zero, as it lacks Ethernet port and anything reasonable to connect to internet. It is also important to store generated certificate in a safe place and secure it with strong non-dictionary password, which will be saved only in our mind. If the requirements are fulfilled, we can start the setup. Below are commands to type as well as output from them, for easier determination of whether the commands were successful or not. Then, we need to save this file into root/openssl.cnf and this file into root/intermediate/openssl.cnf. Inside them, the only thing that have to be changed is dir property in CA_default section. Use absolute path to your directory. Note: when giving values for certain fields, better give some country, state (I have just checked it’s necessary), ON, most importantly, Common Name and e-mail. Just in case some program will check if they exists. In the following parts, wherever [domain] appears, it should be changed to hostname of our hidden service. Then, we will sign the request with intermediate CA private key, thus issuing the certificate. But first of all, we need to receive the CSR from the server, to intermediate/csr/ directory. As can be seen above, all necessary files had been moved to tls directory of our hidden service main directory. From now on, we need to use https://[domain].onion to visit our site, as it is now TLS-encrypted and using port 443, which is default for HTTPS. For convenience, we can set up another httpd vhost on different port, that will redirect all HTTP traffic through HTTPS and link it to port 80, so remembering about https in address will not be necessary. But, it is only optional, so I will leave it as an exercise to the reader. From this point it is useful to have Firefox that is not constantly reminding about insecure connection. 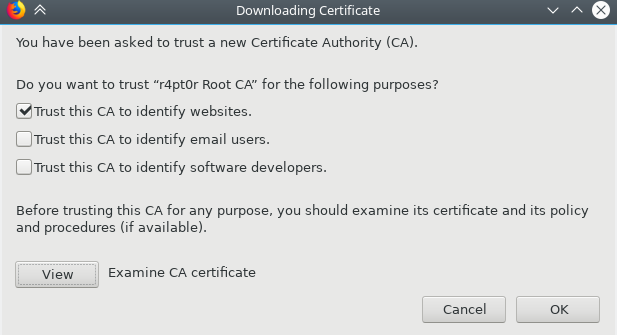 To prevent this, we should install CA certificate into Firefox. 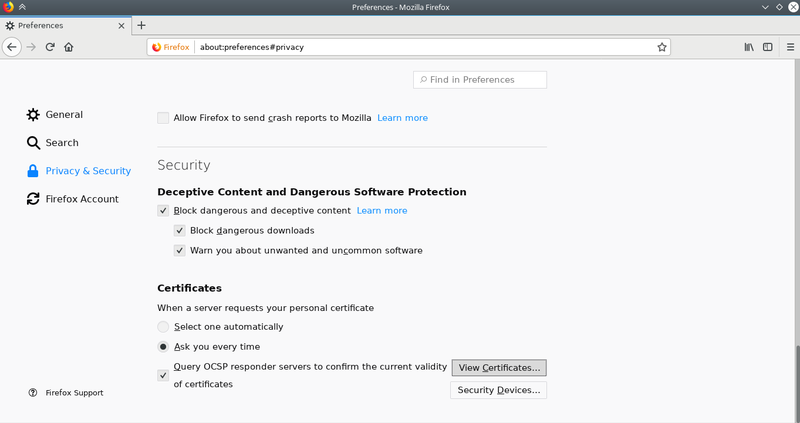 One remark here: as we are going to hack Firefox to trust our certificate, now our whole browsing through that instance of Firefox relies on our CAs private key. So, it is best to not use the same instance for anything else unless you are really sure, the private keys for both root and intermediate are perfectly secure. Finally, we are secure and no exclamation mark appears!